Through the early years of horror, audiences were treated to ghoulish figures, mostly supernatural or physically deformed in some way. Monsters like the Wolf Man, Nosferatu, and the Mummy had very few identifiable human characteristics. In the 40s and 50s, America’s pre-occupation with World War II and the Cold War, led filmmakers to examine the fantastical monstrous horrors associated with atom and nuclear bomb usage. The result was films like Godzilla: King of the Monsters, The Deadly Mantis, and Creature From the Black Lagoon. Then, in 1960, a monster of a different sort surfaced on movie screens that changed Hollywood (and more appropriately, the world) forever. This monster was all too human, and therefore, all too sympathetic. It was the type of monster that could be residing next door to you, as the pastor of your church, the teacher of your children, or even your best friend. This monster was of course, the psychopath and the film that introduced this notorious character to film audiences everywhere was the classic Alfred Hitchcock masterpiece, Psycho. After a lunchtime rendezvous with her lover, Marion Crane (Janet Leigh) returns to work with a burden. She and her lover want to run off together, but their current financial status won’t permit. Trusted with a $40,000 deposit to be made for her employer, Marion instead drives off with the money and prepares for a long drive to the city her boyfriend, Sam Loomis (John Gavin) works in. On the journey, paranoia takes hold of her. She stops and purchases a new car with part of her newfound funds, to further hide her trail. Then, along a rainy and desolate stretch of road, she stops for the night at a tiny motel near an ominous house on a hill. The motel is run by Norman Bates (Anthony Perkins), a squirrelly man burdened with the need to care for his ailing and somewhat crazed mother. After a long talk with Norman over milk and sandwiches, Marion decides to drive back to Phoenix to give the money back to her employer and take whatever consequences are to come her way. Instead, during a late night shower, she is brutally murdered by Norman’s jealous, psychotic mother. Upon discovering his mother’s grisly actions, Norman has no choice but to protect her. After all, "a boy's best friend is his mother." He cleans up the crime scene and nervously sinks Marion’s body inside her car in a nearby swamp. Back in the city, Sam and Marion’s sister begin an investigation into her disappearance, with the help of a clever detective Arbogast (Martin Balsam). Will they find out what happened to poor Marion? Will the $40,000 be recovered? Most importantly, will Ms. Bates be stopped before more victims fall to her broken, deranged mind? Alfred Hitchcock’s Psycho is revolutionary in so many ways. Not only did it introduce audiences to the psychopath, but it also gave the cinema world one of its earliest, and best twist endings. Until Psycho, horror films usually featured a happy resolution (the square-jawed, handsome hero defeats the monster, with his best girl at his side) that is the very definition of a stereotypical “Hollywood ending”. The outcome of Psycho is neither happy, nor Hollywood, as Hitchcock prefers to offer audiences one last shock followed by a chilling uncertainty. Some feel the coda drags about five minutes too long, but I think it’s a perfect build-up to the film’s final, haunting frames. The film also gave birth to what we know as the modern slasher film. Yes, there were German krimis made as early as the 1930s and 40s, but Psycho lays down the groundwork many of the “body count” films that would become much more popular in the 1970s and 80s. It also gives us one of the earliest examples of a deranged family slasher, much like The Texas Chainsaw Massacre. It’s not hard to see why, though, knowing that both films were inspired by the very real serial killer of Wisconsin, Ed Gein. Psycho is truly note perfect. There isn’t a single thing they could have added to the movie that could’ve made it any better. The acting is some of the best in the Hitchcock canon; at times as stagy as other films of the era, but at the same time, completely realistic and effective. Janet Leigh would later have a much more famous daughter (Jamie Lee Curtis) who also cut her cinematic teeth in the slasher sub-genre with John Carpenter's 1978 icon, Halloween. Joseph Stefano’s script based on the Robert Bloch novel is terrific. It’s lean, well-written, and well-structured. Most of the first half of the film plays out like a crime “road” movie, where you don’t know if Marion will get away with the money or not. Then, when she is murdered, the audience is left with no one to root for, except Norman Bates, who desperately tries to clean up after the mess his mother made. Then, we’re forced to get to know Marion’s sister and Sam a little better, so they become the makeshift heroes. Norman himself becomes a sort of everyman hero as well. We all hold our collective breaths when in an attempt to protect his mother, he tries to sink Marion's body in the swamp. At first the car goes down, but then it stops, with much of the top and trunk still sticking out of the muck. We actually care about Norman at this point and hope that it'll continue to sink. It's very interesting how Stefano and Hitchcock were able to manipulate audience allegiance and emotions in such a bizarre way that we would actually root for someone who is trying to cover up a murder. Only in a Hitchcock film. The film isn’t bloody, although through the use of clever editing, sound, and music, the infamous shower murder sequence is very much as violent and terrifying as anything you’re ever likely to see on screen. We never see the knife make actual penetration or contact with Marion’s body, but we hear every fleshy tear and see plenty of blood (actually, chocolate syrup) fall to the floor of the tub. It is without a doubt, one of the most brutal murders ever committed to film, a far cry from some of the slasher sub-genre’s weakest “one-stab” kills that were popular in the 80s. Have you ever seen a slasher movie where someone gets stabbed one time, maybe in the stomach, and they they instantly die? You’re left thinking “I’m sure they could’ve easily survived that. 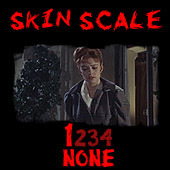 How lame!” One thing is for certain, when Marion Crane gets murdered in the shower, she is positively deader than just about any other slasher movie victim I have ever seen. If she were to somehow walk away from the attack still living, well...it wouldn't be pretty. This sequence is studied by film students everywhere and it has a truly well-deserved reputation. It’s interesting to note that the film was shot in black and white, although it could’ve easily been shot in color. Hitch had directed many color films leading up to Psycho, however the Master of Suspense felt that the film’s brutal murder sequences were still a bit too much for audiences at the time to take in color. Black and white gives the film a much more haunting and classical horror feel. A color Psycho would be interesting to see, but I’m very much glad that Hitch went the black and white route. You don't really get the kind of eerie lighting and shadow effects in color movies that you find in those that are black and white. The film came at just the right time in the 20th century. A decade before, Hollywood horror had been concentrating on aliens from other worlds, atomic-bomb abominations, and creatures from just about every dark and hidden orifice of the earth that you can think of. Psycho brought horror into the modern age. Gone were the dank, spider-webbed castles, mansion corridors, and caves of old. We are instead given an aging motel, a desolate, forgotten highway, and a decrepit family home looming on the horizon. Instead of the villain having claws, fangs, or a ray gun of some sort, we are given the crudest of stabbing weapons; an ordinary butcher’s knife…found in every kitchen in America. The villain of the film is likewise no deformed monstrosity, no mutated freak, or accident of nature. The villain is human, and surely not much different from you or I. Perhaps, like Norman suggests at one point “We all go a little mad, sometimes.” With the exception of this movie and The Birds, Hitchcock stayed away from the horror genre. He preferred suspense thrillers to straight horror, and even within the genre, he has been quoted saying that he is uninterested in the supernatural. Perhaps he was right. The normal, human mind suddenly becoming corrupted and crazed to the point of committing murder is certainly a horrifying thought. Using his unmatched power of generating on-screen suspense in combination with the concepts and sequences of pure horror, Hitchcock truly has one up on many people who have since tried to rip-off the subject matter and style of Psycho. They may try to ape the horror, but only one man can create suspense in the most ordinary, and trivial of sequences (see the tennis match sequence of Strangers on a Train). Hitchcock will never be topped. Lastly, I'd like to mention Bernard Herrmann's incredible score for the movie. Its use of frantic and screeching violins has been copied so many times (most notably by Re-Animator and Friday the 13th) but none can equal its power to terrify and generate tension. It perfectly conveys the twisted mindset of a psychopath and serves as the all-time best horror movie score (rivaled only by Halloween for sheer impact). Psycho has been analyzed and studied more than any other horror movie in existence. Is it worth all the hype and acclaim? Absolutely. Like the finest of wines, it just gets better and better with age. You will find no other better all-around film in the horror genre. This is truly the best there is, the best there was, and the best there ever will be. Hitchcock might have thought he was only making a cheap, dirty little quickie with the use of his Alfred Hitchcock Presents television crew, but he ended up making an all-time classic. If you do not already know the ending, don’t read another word on the film anywhere. Go now and immediately buy the DVD. It will knock you out of your socks. If you want to truly see one of the legends of the horror genre and THE quintessential grandfather of the slasher film, Psycho is the film to see. Don't make mother mad! If you fancy yourself as a well-versed horror scholar and have yet to watch Hitchcock’s masterpiece of the macabre, it is highly Essential!